Comic art and the wider culture that it has created, is now a huge mainstream industry. The largest shows in Europe and the USA attract hundreds of thousands of visitors every year. The main festival will be free to the general public and will encompass the whole town. 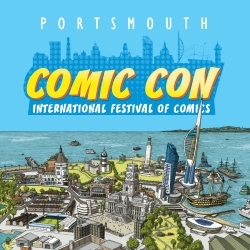 We will also have a full programme of ticketed entertainment and inspiring educational events taking place throughout the weekend for those of you who are already converted to the wonders of the comics medium. These include workshops for kids, seminars, live art demonstrations and portfolio reviews for aspiring comic artists. All profits from the festival will go to the local Charity Share. You can find out more about our charity here. Unlike many other festivals in Shrewsbury, this event will drive people into the town centre and not away from it. We are encouraging visitors from all over the UK and beyond to visit local restaurants, shops and use local services and we are working with local business and the local authorities to make this happen.